You must be a member of the Barcelona DinnerNations Group to attend this activity. Would you like to join this group? To continue our alphabetical “Voyage du monde” let’s make our V dinner an afterwork Vendredi/Viernes celebration of Vietnam! 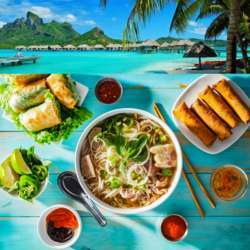 Emerging as an independent republic after years of French colonialism and conflict, nowadays Vietnam conjures up images of a tropical paradise with sun-kissed beaches, colourful culture and of course, mouth-wateringly delicious food! Nem rán – Crispy Spring Rolls - veggies & glass noodles / mushroom & meat. Gỏi cuốn sống – Rice paper rolls filled with noodles, shrimp, salad and herbs. Phở – Traditional rice noodle soup with beef and condiments. Thịt xiên nướng – Grilled spiced pork skewers with special sauce. DRINKS: Welcome cocktail, open bar of wines, beer, cava and non-alcoholic. Based on the number of email confirmations I will decide the final numbers for catering 24 HOURS BEFORE THE EVENT. PAYMENT: in cash on arrival at the event, thanks!